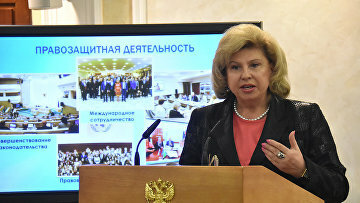 Moskalkova proposes to use video records as proof of election fraud | Russian Legal Information Agency (RAPSI). MOSCOW, October 29 (RAPSI) - Russia’s Commissioner for Human Rights Tatyana Moskalkova has proposed to legislate the use of video records from voting stations as evidence of alleged violations during elections. She said during a conference held in the Central Electoral Commission on Monday that amendments are to be submitted to the Criminal Executive Law. The ombudsman also suggested development of an Electoral Code to put all relevant regulations in order. The elections conference was held to discuss problems of modern election legislation, its development path and application of sophisticated technologies in the election process. Members of Russia’s State Duma, Federation Council, Constitutional Court and Public Chamber took part in the event along with members of scientific and expert community.